As well as being pioneers in the future in space exploration, NASA often provides amazing royalty free images, a fantastic resource for creating space-based personalised T-shirts. Just a month ago, NASA’s New Horizon Probe did a flyby of Pluto and gave us some awesome images of our solar system’s smallest planet (and yes—I’m still calling it a planet). As marketers, it got us thinking: how long until alien planets start promoting their allure? I mean come on; eventually we’ll have colonies on neighbouring planets, so naturally, we’ll have interplanetary tourism, right? We’ll see marketing campaigns to attract visitors, and the different planets will compete for cosmic customers. So we over here at Printsome have decided that for this week’s uber-creative marketing exercise, we should launch 9 marketing slogans to promote the planets of our solar system. Your job is to imagine that you’re a future human, reading a future-magazine and skimming over these ads, or something. Which planet would you want to visit? The largest gas giant in our galaxy is a dizzy mix of endless storms. Orbiting the planet are its 67 moons, on which you, our happy colonist, has a selection of hundreds of luxury moon station accommodations. But the real reason you’re here is for the Gas Surfing on our Indestructible Gliders. 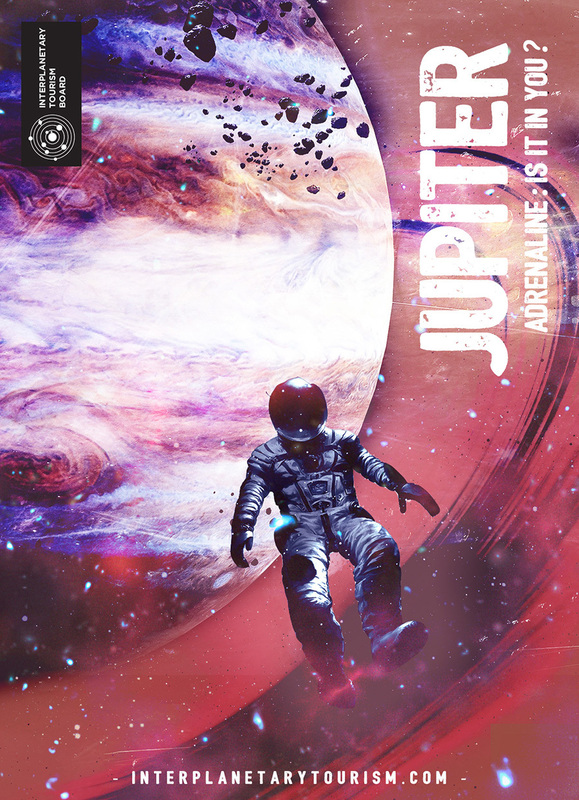 Cruising the swirling storms of Jupiter will rejuvenate your youth like nothing else. Come, get carried away! 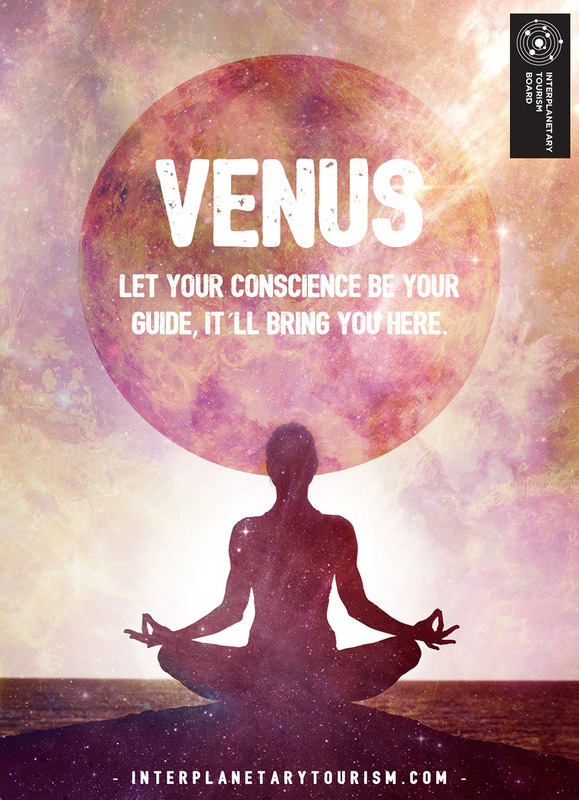 Don’t let the lack of atmosphere fool you—Mercury is the best place to enjoy our stay. As the planet closest to the sun, Mercury’s mobile colonies enjoy endless summers. Soak up the unfiltered rays and perfect that tan. Watch Mercurian artists’ installations capture the light and cast it out over the craters and dunes in fantastic displays of colour. 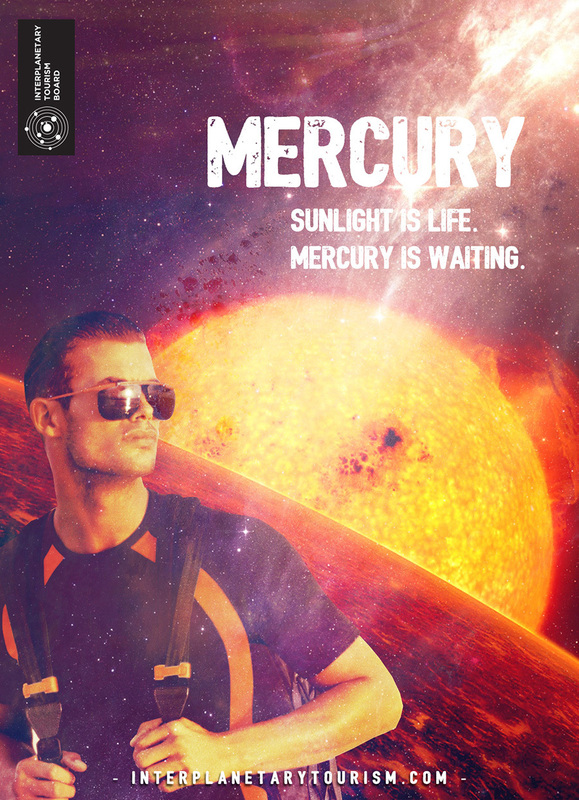 Fly to Mercury and live in the sun, any time of day. Earth has been and still remains the homeworld of our forefathers. Come experience the history of your kind, and the biodiversity of the only planet with confirmed life. Trees and habitable ecosystems dot the globe, with beaches, snowy mountains, wild oceans and bustling cities for your enjoyment. 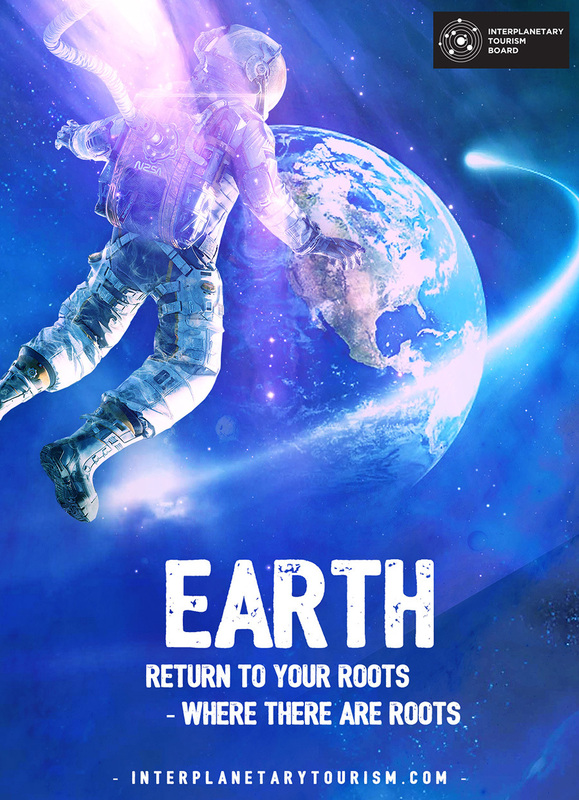 No need for protective space gear or extra supplies of oxygen, we were made on Earth and Earth is where we belong. Come home. 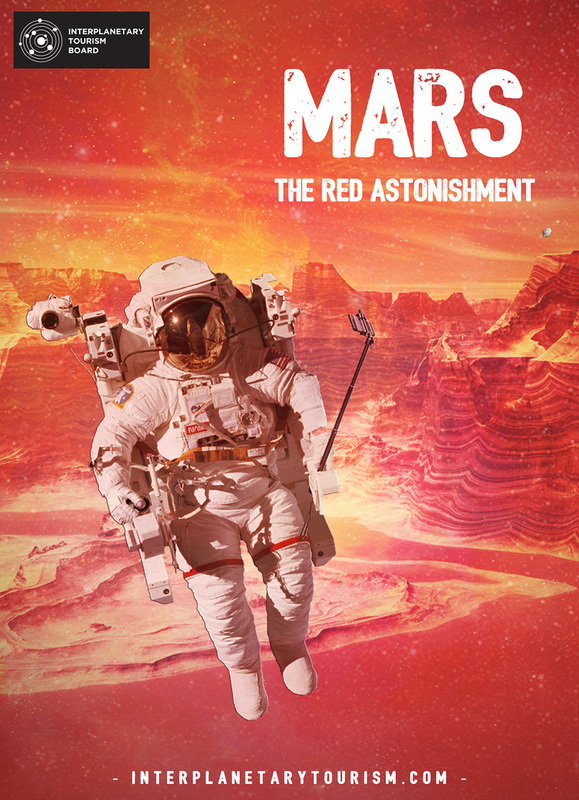 Join the exodus to the Red Planet and prove to family and friends that you’ve seen it all. Selfies have never been the same since tours of Mars’ wonders commenced. Start at the brilliant Olympus Mons, a volcano the size of France and 25 kilometres high. Then jump aboard for a shuttle tour of the 4,000 km long, 200 km wide and 7 km deep Valles Marineris canyon. And no trip to Mars would be complete without a solar cycle spin across the expansive Borealis basin. Ready to be astonished? 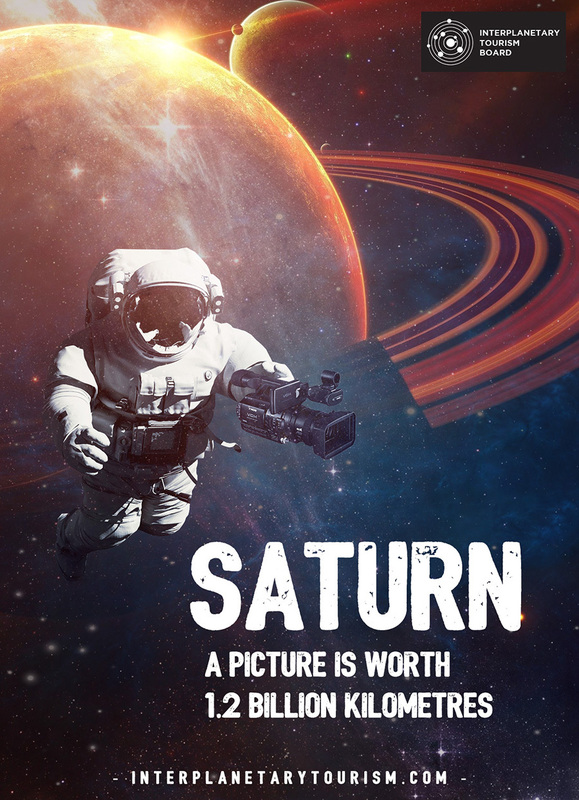 Saturn is a ringed pearl on the hand of the cosmos. Capture spectacular photographs from our orbital stations when the sunlight glints off the rings and brings the planet to life. Then, shuttle down through the yellow atmosphere of Titan, Saturn’s icy moon, to experience only oceans apart from Earth’s. This is the photographer’s dreamscape that your eyes will not soon forget. Uranus. It´s funny, and we love it! 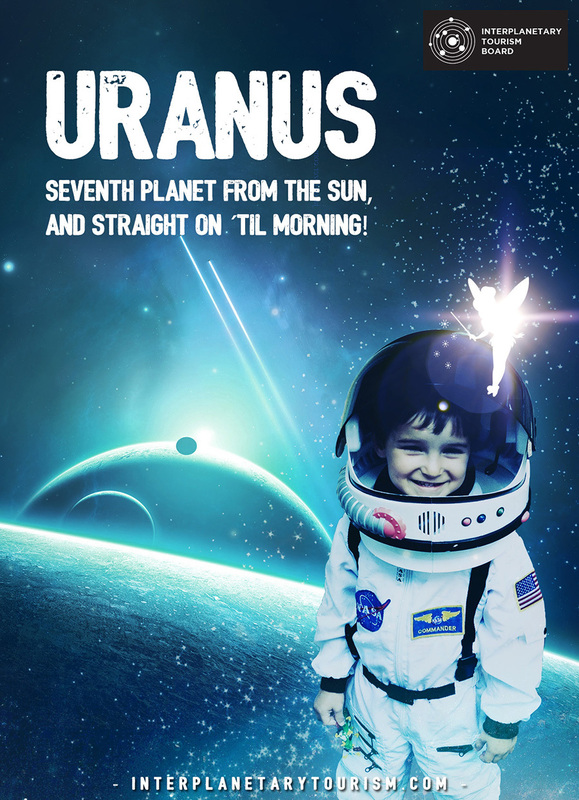 Kids love it too because Uranus’ orbital platforms are family-friendly fun hubs where children can let loose. A vacation to Uranus means endless entertainment. Gravity tubes are transparent space water slides that let kids dart out from the platform for exciting views over turbulent Uranus. And while the little ones sleep, adults enjoy famous musicians that play to a backdrop of the ice giant’s mass. Uranus. It’s for everyone! Nothing captures opulence like our Starline cruises through the cool cloud cover of Neptune. 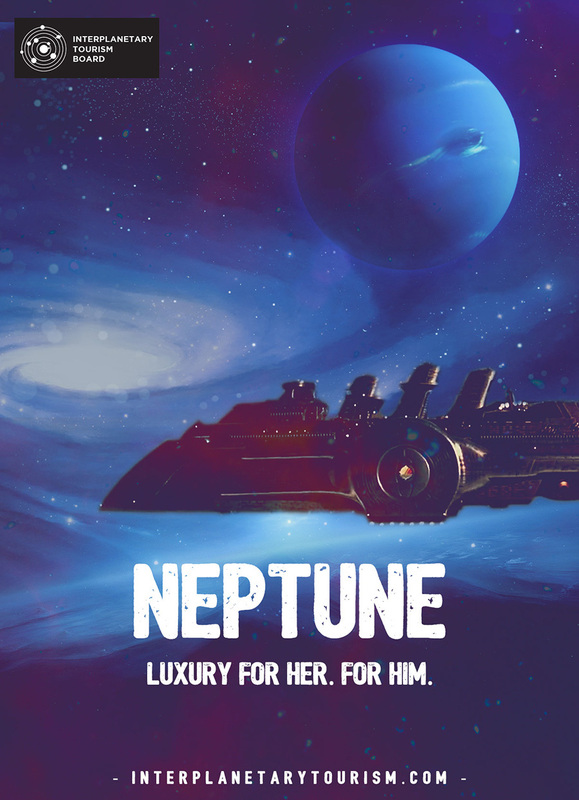 Our high luxury mega ships glide above the ice giant, with glass-bottom accommodation that allows you to feel the violence and elegance of Neptune’s beautiful atmospheric layers. Dine with class and enjoy perfect pampering: come to Neptune, and soar above the rest. Thinking of winding down after retirement? Want to get away from it all, to see the final frontier and relax? 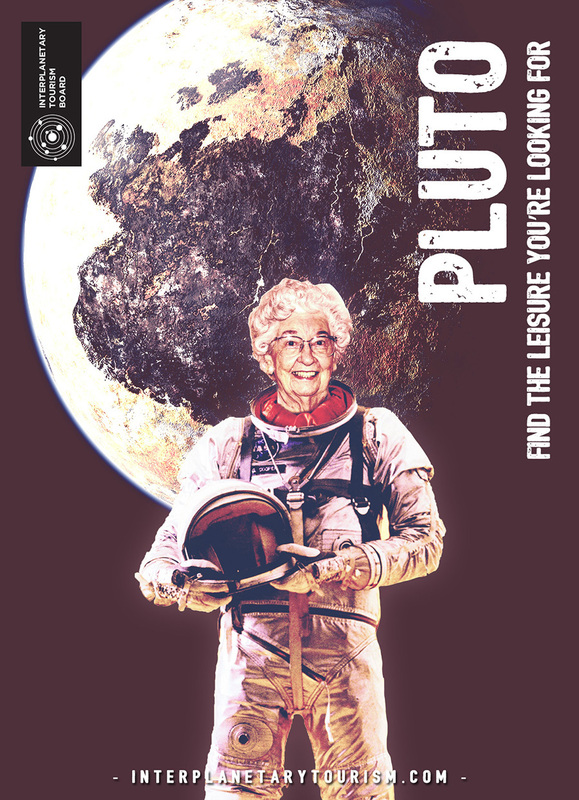 Pluto is the dwarf planet for you. Smaller than the moon, but with magnificent ice mountains and rocky topography, Pluto makes for a calm getaway with low atmospheric pressure, so there’s really no better way to release the pressure, so to speak. Alright, so we didn’t include the other dwarf planets Haumea, Makemake or Eris. Let’s just say we would’ve also had to include all the moons, but we didn’t. 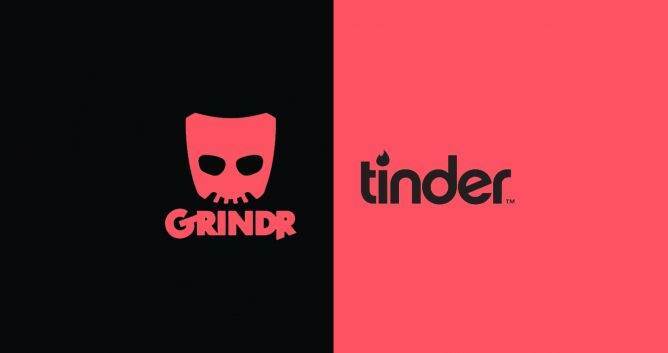 You have to draw the line somewhere, and maybe humans just wouldn’t have made it to those other bodies yet!